Heat oven to 300ºF. Spray with cooking spray or grease 15x10x1-inch baking pan with sides. In very large bowl, mix cereals, corn snacks and peanuts. In small bowl, beat egg whites, orange juice, sugar and cinnamon with wire whisk or hand beater until foamy. Pour over cereal mixture, stirring until evenly coated. Spread in pan. Bake 45 to 50 minutes, stirring every 15 minutes, until light brown and crisp. Cool completely, about 1 hour. Store in airtight container. Variation: Change the flavour just a bit by using apple pie spice instead of the cinnamon. Did You Know? 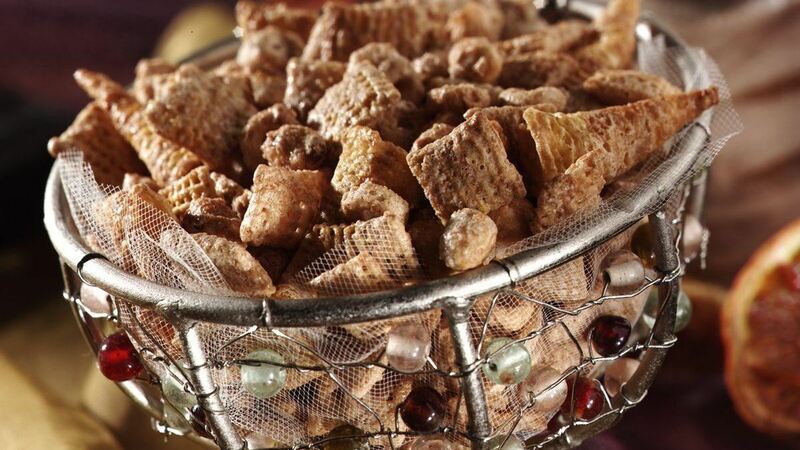 : The baked-on egg white and sugar mixture creates a unique crispy coating on the cereals.